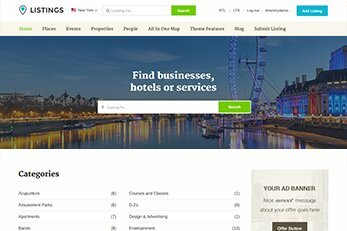 Listings is one of our WordPress themes designed to help you create, manage and monetize a listings directory site. 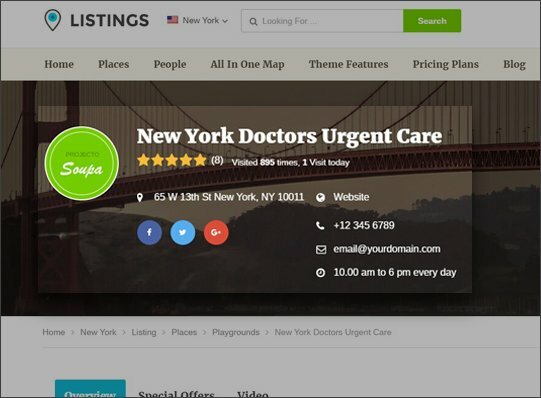 You can create a listings directory website for literally any purpose. 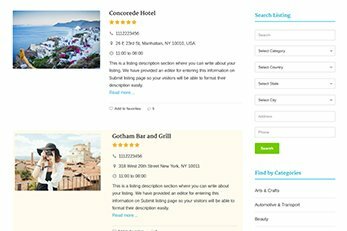 You can build an online business directory which allows various businesses such as Car dealers, real estate agents, hotels, restaurants, tourism companies to submit listings. 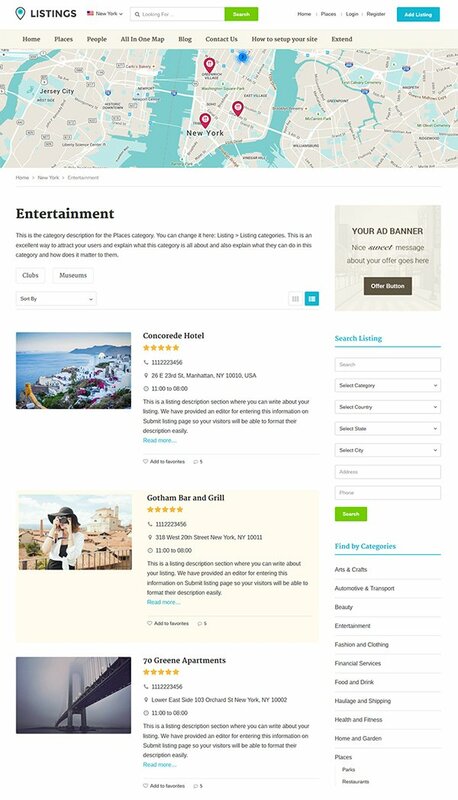 This theme comes with many powerful built-in functions such as free or paid packages, unlimited custom fields, categories, cities and it’s very easily customizable. The Listings theme is better alternative of Listable theme and Listing Pro. One of our child themes for the powerful Directory Theme (included with Standard or Developer license). Built for business or niche directory websites, you can use it for almost any type of directory. 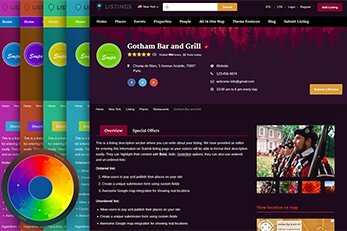 Any listing or business finder theme wouldn’t be complete if visitors from mobiles couldn’t view it properly. 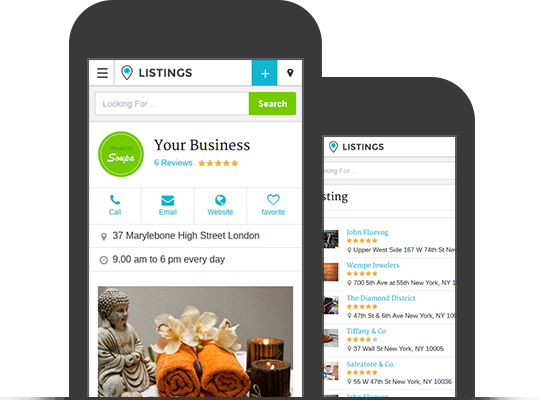 The good news is, as well as being a responsive Listings directory theme, it also comes with a mobile app view. The mobile app view is great as it offers visitors on mobiles devices a minimal view. This makes any listings website load super-quick and offers easy navigation for mobiles, tablets other mobile devices. Click here to view the Listings theme demo on your mobile device. Each listing can have its own header image. What’s great is that users submitting a listing will be able to upload an image with their listing. The Listings theme’s homepage banner location gives you 3 options. 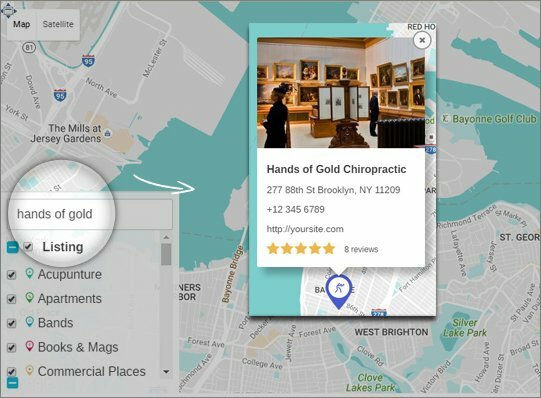 You can display a big Google Map with listings, use this area for an image slider of custom images or fetched images from listings. 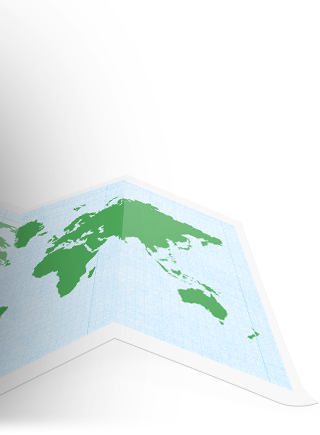 Offer users a powerful searchable homepage map. This option is a great and easy way for people to find businesses on your listings directory. The map shows the listing categories you wish to show for a particular city and keyword search is also a feature. 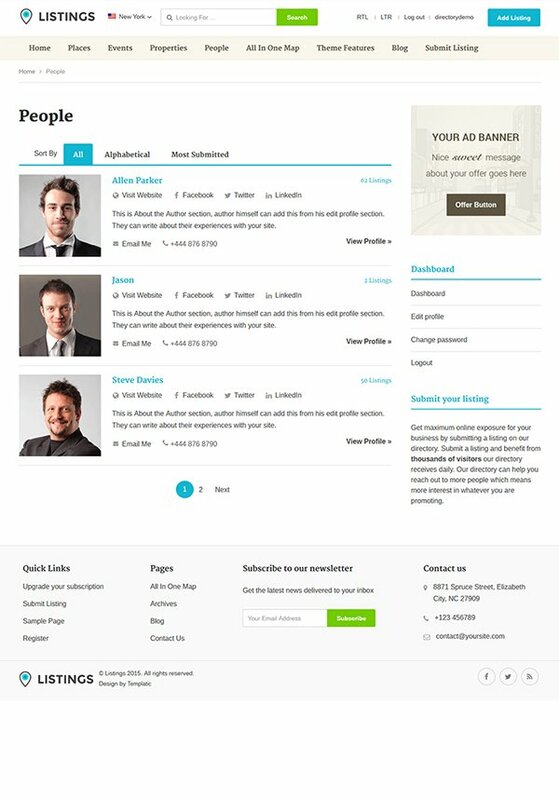 This is a very highly versatile WP theme for listings and directory websites. 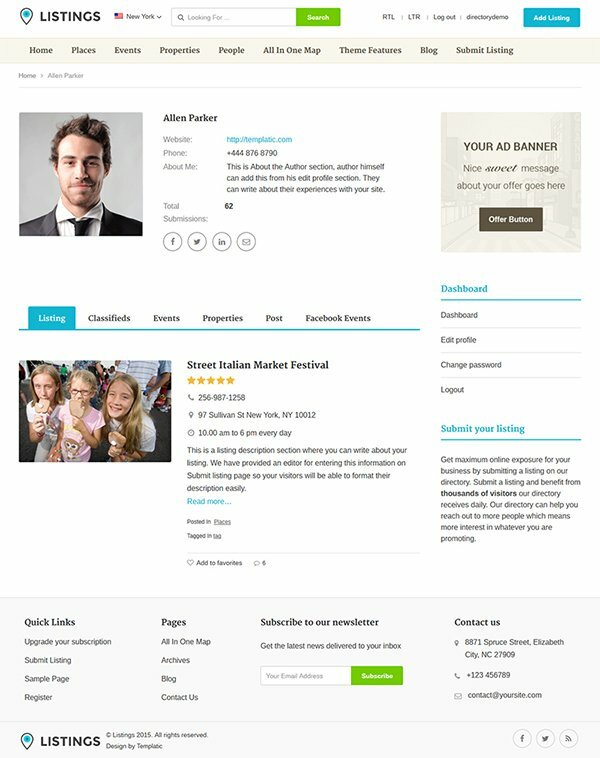 Loaded with Directory’s powerful built-in functions, this theme is designed to help you earn money and make building your directory super-easy to launch. You can also offer free listing submission if you like but if it’s monetization, check out just some of the features you get. AdSense or other banner ads. Featured listings options in packages. Charge extra for particular listing categories. Powerful unlimited custom fields system. 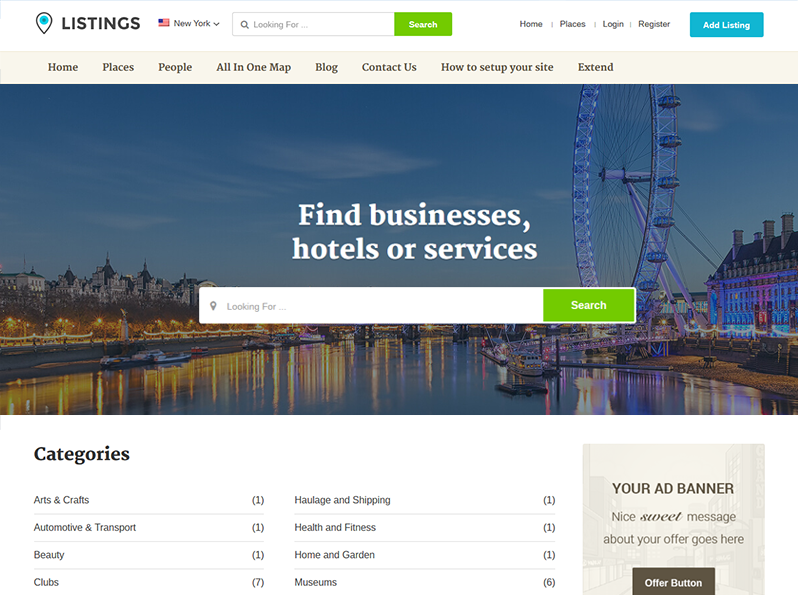 Creating an online listings directory that’s easy to find online is what this theme is about. 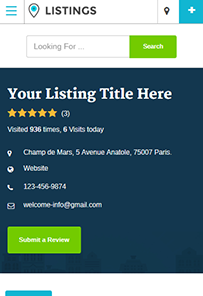 Listings is a completely SEO friendly theme. To optimize the content on your pages you can use popular SEO plugins for WordPress. It works perfectly well with Yoast SEO, All In One SEO, Google XML Sitemaps and All In One Schema.org Rich Snippets plugins. RTL Support, Translatable and WPML compatible Listings Theme! 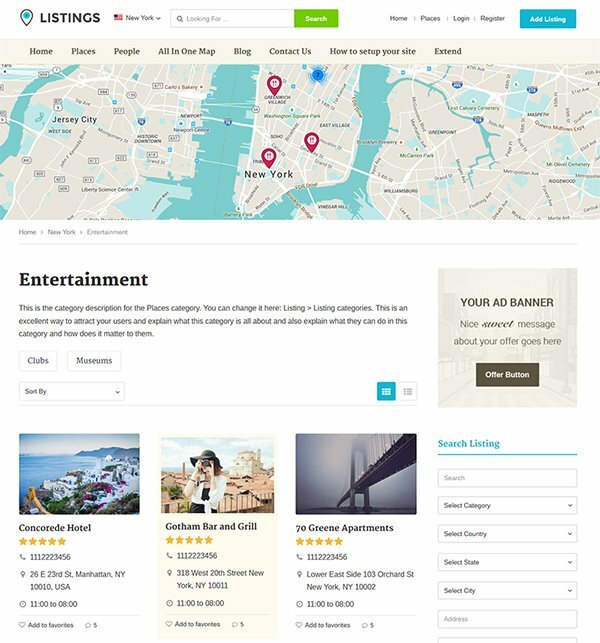 This listing directory theme has been tested with world popular WPML plugin. This is the perfect plugin for creating multilingual directory websites. You can of course translate the theme into another language with the provided .PO and .MO files. The Listings theme also supports RTL (right-to-left) languages such as Arabic or Hebrew. 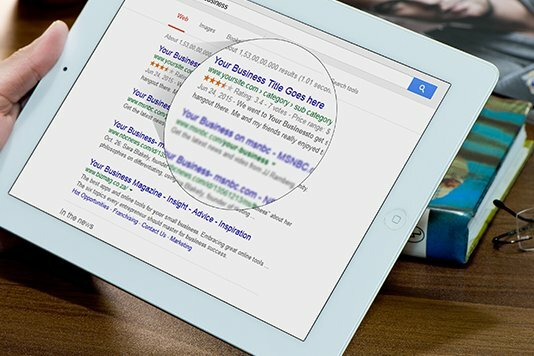 Your website will look just like you want it to. Harness the power of drag and drop page builder in your directory website. 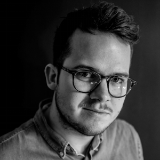 So if you want to change the location of a theme element, or add some new sections to your website, just drag and drop. Creating responsive pages was never easier. So you don’t have to change a line of code or edit the CSS files to manage the content of your directory site. Organize pages with the intuitive options of this front end WordPress editor. Use the built-in skin builder to change design elements and the styling of your website. We have you covered with integrations to the industry’s best booking services. 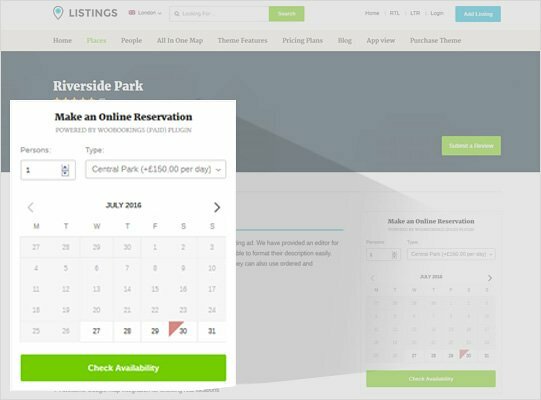 By Installing WooCommerce Booking plugin turns your portal into a fully fledged booking system. 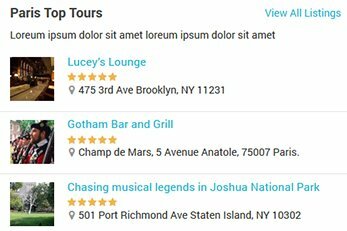 The Templatic Listings theme is also compatible with some of the most popular WordPress plugins. 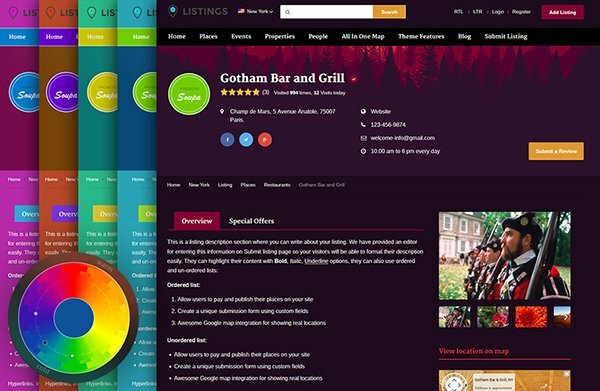 Some of the powerful built-in features which make our WordPress Directory Themes the perfect platform for successful online listing directories. 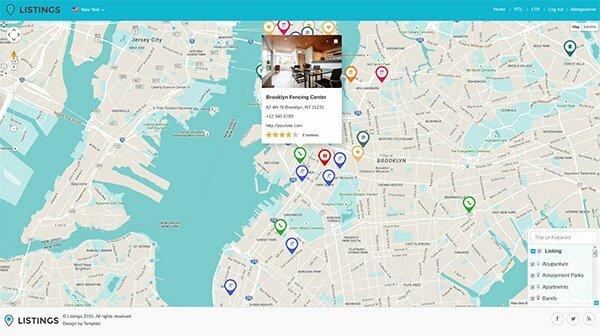 No matter if you need to launch a directory for companies, services, industry, restaurants or use it as a travel guide, here are just some of the powerful options at your disposal. See more built-in functions here. Use this powerful tool which works in .CSV format to import/export listings or cities on your directory website. No need to touch the code. Control all aspects of your directory with Listing’s comprehensive admin dashboard. Built with an amazingly flexible submission packages system. Allow front-end users to submit and manage listings. Offer visitors easy and advanced search. This theme offers you many search widgets to choose from. 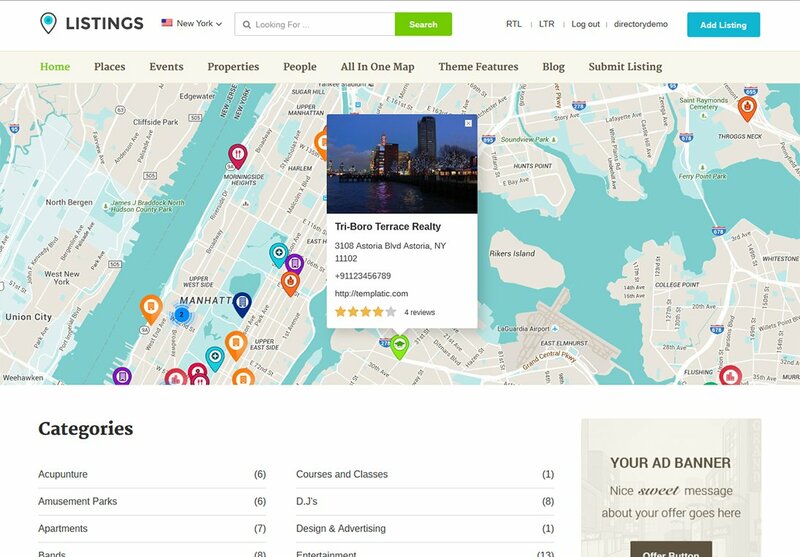 As with its parent theme, Listings can also show a map on the homepage. 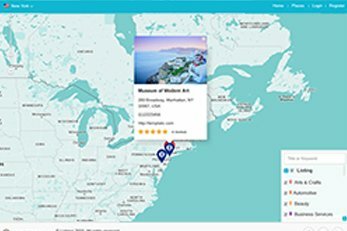 There are also many other maps included such as on listing detail, category pages and the All In One map. Add an unlimited number of custom fields straight from the admin dashboard. Creating category-specific fields is also possible. 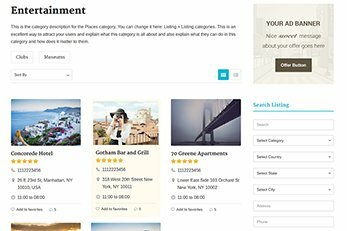 The sky is the limit with what you can use the listings theme for. Depending on how you will use this theme, you can Enable/disable user registrations. If you don’t want to allow front end listings – simply disable registration. Your users will have their own dashboard from which they can manage their listings. 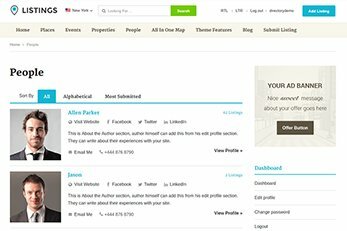 A user can edit, renew or upgrade only their own listings. This is not in any way linked to your admin dashboard. 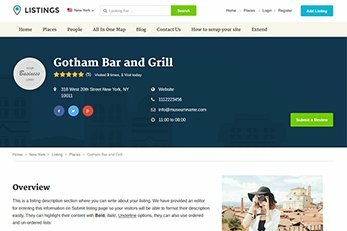 Launch a business/listings reviews website with this smart rating and reviews system. Manage e-mail notification templates straight from your admin dashboard. No need to edit any code. Change the default color scheme from the admin dashboard with an infinite color selector. This theme utilises awesome Google Fonts to give it that sleek and unique look. The theme is power-packed with amazing built-in functions. 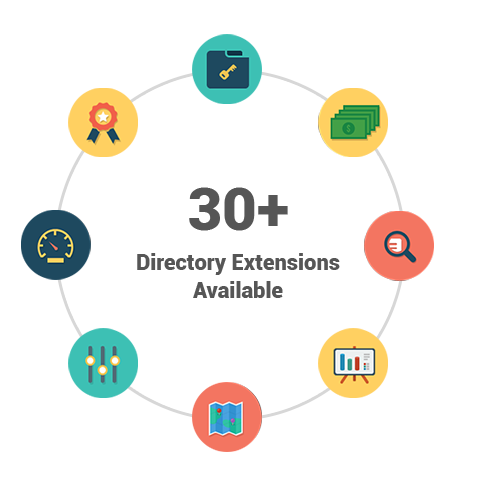 But if you wish to add more features, you can choose from the 30+ advanced paid Directory extensions. The Listings theme comes with the PayPal payment gateway included. This makes it possible charge for listing submission if you have any paid packages. You also have the choice of 15+ compatible paid payment gateway add-ons. You may want to choose the payment gateway based on your location or currency. So here are your options. 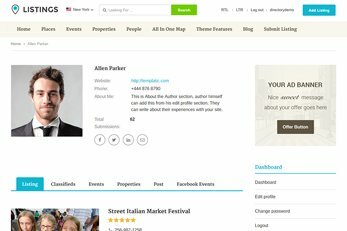 Built with focus on style and functions, this listings directory theme is sure to impress. 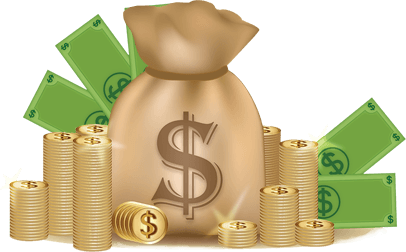 Purchase this moneymaking theme today and put earning online into overdrive. 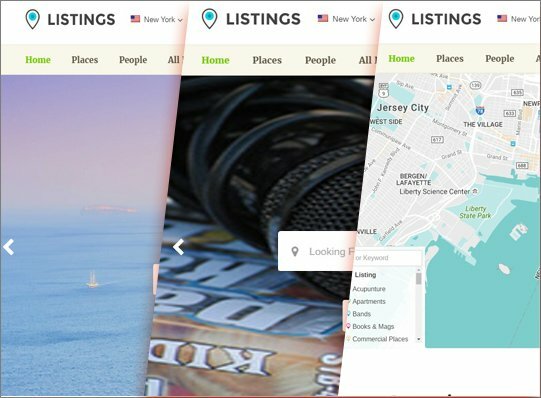 Listings is multi-purpose, customizable and very easy to use.